What is the Best Hosting Solution for WordPress? So you’ve decided to start your own WordPress blog. Now, you need to make a decision about the best option for hosting. Once you begin to explore all of the different options, you’ll find that competition is abundant in the hosting space. There are numerous companies that offer hosting solutions designed specifically for WordPress, and different companies are always offering incentives to reel in new business. However, you’ll not only have to select a hosting company, you’ll also have to select a hosting option. In this article, we’ll go over all of the different options and discuss which is best depending on your requirements. What is hosting, anyway? Essentially, it’s how you make your WordPress website publicly available on the internet. This process starts by registering your domain name with a registrar. For example, if you’re opting to go with xyz.com as your domain name, you register it to make sure that you “own” that name and nobody else can use it. This is an important part of hosting because, typically, the hosting company will register the domain name for you. Once the domain name is registered, the hosting company will make ensure that your domain name is linked to the disk drive space that you’re renting on one of its servers. Then, when someone types “http://xyz.com” into a browser URL bar, the browser will load the files from your rented space. The information from those files is what is displayed in the browser window. A hosting provider will usually give you email addresses and disk drive space for email as well. The company will also provide operating system updates, apply software patches, and ensure system security on your behalf. Basically, all you have to worry about is blogging. You’re going to have to decide on a hosting option for your WordPress site. There are four basic options available, each with differing features and price points. Budget shared hosting is an option that puts you on the web, but you share the server with dozens, hundreds, or even thousands of other customers. That’s why it’s so inexpensive. In your many excursions throughout the web, you’ve probably noticed an ad or two promising hosting for what seems like an unbelievably low price per month. 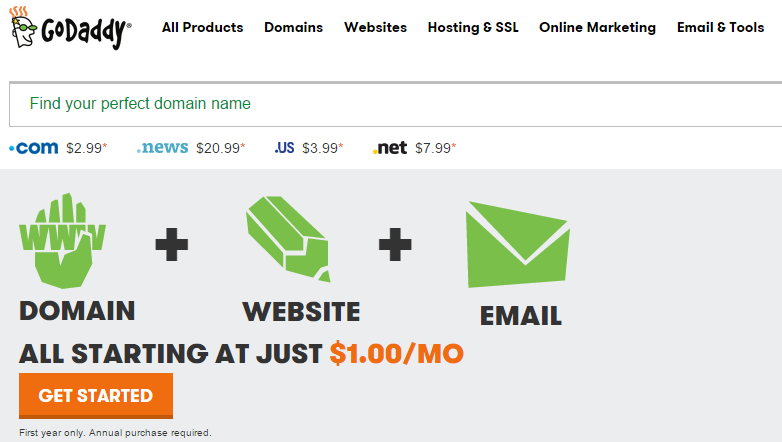 As of this writing, GoDaddy is offering a hot deal for web hosting “starting at” $1.00 per month. Obviously, the phrase “starting at” is a red flag when you see any type of sale being offered. It means that you have to fulfill a very specific set of requirements in order to qualify for the great price. Also, keep in mind the familiar phrase: “If it sounds too good to be true, it probably is”. The various hosting companies, thanks to the aforementioned level of competition, are notorious for making promises that are just plain unrealistic. For example, many companies advertise unlimited monthly data transfer. Try hosting a video that goes viral and you’ll quickly learn that the company has a very peculiar definition of “unlimited”. When you’re sharing the same server with hundreds of other customers, you’re increasing the likelihood that some novice user will introduce a vulnerability into the system. That means hackers could get into the system and access your data, even though you aren’t the one who made the mistake. That’s a risk you’ll have to consider if you want your data to be secure. Finally, be sure to read the proverbial fine print with budget hosting. You may be required to make an inordinately long commitment, or you might believe you’re getting a feature that’s actually only available to higher paying customers. All that aside, you will get hosting with a budget shared option. So if you’re looking for an economical way to make a statement online, the budget shared option might be best. As with everything else in life, you’ll get what you pay for with a budget shared option. Since you’ll be sharing the server with a multitude of other people, you might find that your response time is slower than you’d like. That means your pages will take longer to load, potentially annoying your visitors. However, that’s the trade-off. You won’t be paying a lot of money, so you won’t be getting great service. Premium shared hosting is just like budget shared hosting with two notable exceptions: It’s more expensive, and you’re sharing the server with fewer people. A good example of a premium shared hosting provider is WPEngine. Typically, premium shared hosting will cost you between $29 to $49 per month, depending on your hosting provider. You can certainly expect to pay more if you request certain additional features that aren’t part of the package deal. The number of other people using that server will vary from company to company. A reputable hosting company will typically not load servers to 100% capacity, so the server won’t be overrun with too many customers. However, you’re often limited in the number of visits you’re allowed per month. So, if you have content that goes viral, prepare for your monthly cost to go up. You’re also restricted on the number of websites you can install. The budget offerings mentioned above will usually enable you to install as many websites as you can fit into your allotted disk space. So what do you get for the additional money? As a rule of thumb, you can expect better security and improved customer service. Usually, the load times will be much faster as well. This is a good option if you’re on a limited budget but still want quality service, and aren’t expecting a great number of hits on the blog every month. If you’re planning on your website providing viral content, or being a WooCommerce site that’ll get a great deal of traffic, you’ll probably want managed hosting. Pagely is a great example of a budget managed hosting company. In a nutshell, you get your own server with managed hosting. That means your hosting provider will rent you an entire server, shared with nobody else, to host your website. The benefits here are obvious. You’re not sharing the CPU with anybody else. That leaves all the processing power on that server available to you and your website. You’ll also not be subject to the security vulnerabilities mentioned above. The selling point here is speed. You’ll have lightning fast response time because you’re not sharing the server with anyone else. Some managed hosting providers also provide a content delivery network (CDN) that will load resources from a server close to where each visitor is physically located in an effort to further improve load times. For a budget managed server, you’ll probably be subjected to noticeable restrictions on both bandwidth and disk space. You’ll also be limited to a small number of websites. You can expect to pay $100-$200 per month for your budget managed WordPress hosting solution. 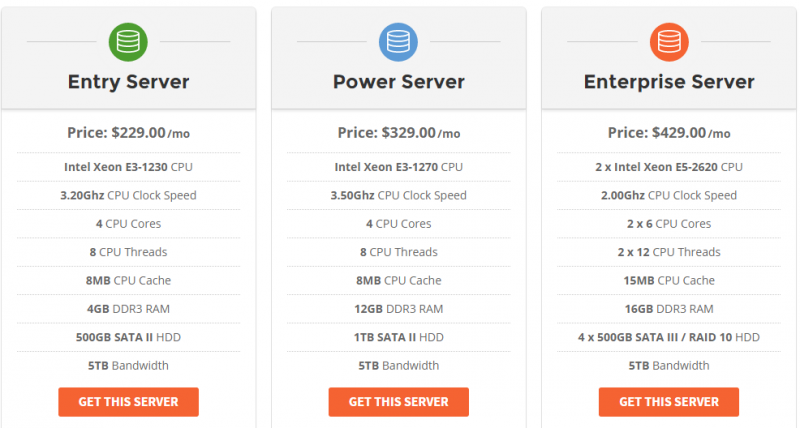 You can expect to spend hundreds of dollars per month on a premium managed hosting solution. However, if you’re planning on deploying a website that will receive thousands of hits every day, this is probably your best option. As you can see from the above chart taken from Siteground, even with premium managed hosting, there are varying degrees of service. You can choose the power of your CPU, the maximum number of threads available to your site, the size of the cache, and the RAM. Obviously, the more you want, the more you’ll pay. The best feature of a premium managed hosting solution is unquestionably the customer service. A good hosting company will offer 24/7 technical support to justify the amount of money you’re spending on the service. Also, the company will have the infrastructure in place to support any unforeseen spikes in traffic. You’ll be fully prepared in the event that your content goes viral. If you’re planning on an enterprise level website that can withstand an onslaught of traffic, this is your only option. The best hosting solution for your WordPress website is entirely dependent on your business or personal needs. If you’re on a tight budget and planning to update it only a couple of times a week, you can probably get away with a budget shared solution. On the other hand, if you’re planning for an industrial strength website that’s very secure and can withstand a spike in traffic, you’ll want a managed solution. It all depends on your budget and your requirements. Have any other questions about the different hosting options? Feel free to ask us anything in the comments section! Get 10 Free Hi-Res Backgrounds for your website. Optimized and ready to use. Subscribe and get great weekly freebies, tips and tricks.